Debra Hammond recently won a new award as a "Lifetime Achievement" for Women in Business for the San Fernando Valley Business Journal. Photo by Lee Choo. For Executive Director of the University Student Union (USU) Debra Hammond, leadership starts with a great team and a close community. Initially, Hammond thought that she would probably work at CSUN for five to seven years at most, but the creative freedom and connection she gets with her students has kept her coming back. She has been leading the USU for more than 23 years. Hammond believes that broader opportunities for students to participate on campus can connect them more closely to CSUN. Once she was set on expanding the USU, she added the Student Recreational Center (SRC) in 2012. The vision was making sure students are grounded in CSUN, which directly led to the creation of the SRC. Hammond hoped to create a positive impact on students by promoting exercise and a safe place to alleviate everyday stress. She also went the extra mile to create the Oasis Wellness Center, a recent addition, to promote student wellness. The Oasis Wellness Center opened in the fall of 2015, giving students a place to relax and destress, offering massages, nutrition counseling and mediation. Hammond notes that her greatest accomplishment, however, is still all about the students. In addition to working at the USU, she was also given the opportunity to teach at the Michael D. Eisner College of Education in the Department of Educational Psychology and Counseling. She enjoys being able to mentor students and assist them in the right career path. “I love the mentorship part of the experience because if it wasn’t for the people who mentored me, I know I wouldn’t be where I am today. My job is to continue in that way so that I can help somebody else,” said Hammond. Hammond’s goal is to make CSUN as inclusive as possible. To do so, she has contributed to CSUN’s Pride Center and Veteran’s Resource Center by allowing students to voice their opinions by stating these spaces were needed and acting on their voices. In 2012, CSUN students advocated for a safe space for the Lesbian, Gay, Bisexual, Transgender, Queer, plus (LGBTQ+) community and the veterans of the campus. Hammond listened to their requests and granted them. Coordinator of the Veterans Resource Center (VRC) Patrina Croisdale stated working with Hammond is amazing because she’s a great role model. Croisdale stated that the addition of the VRC and Pride Center have added the diversity initiative that the USU needs. The VRC supports students who are veterans and creates a community for them to interact in. The Pride Center provides the LGBTQ+ community a place to be themselves, as well as receive extra support and guidance. “The VRC and the Pride Center have brought an element of diversity that didn’t necessarily exist before,” said Croisdale. Sarina Loeb, coordinator at the Pride Center and a former student of Hammod stated why she believes that Hammond is an inspirational woman. She supplies a lot of guidance to the CSUN community. While Loeb was graduate student, she took one of Hammond’s courses and was mentored by her. 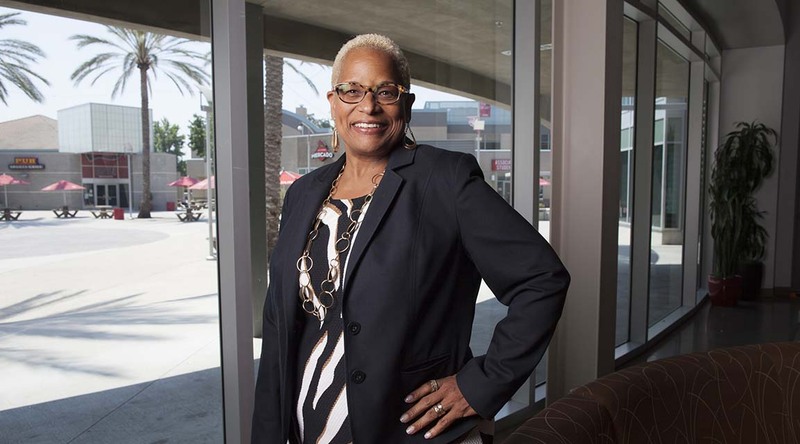 Hammond’s achievements aren’t just on campus, as she recently received the Lifetime Achievement award at the 16th annual Women in Business Awards presented by the San Fernando Valley Business Journal (SFVBJ). She said she is humbled to be awarded and describes herself as a servant leader, situational leader and a transformational leader. Her goals are to serve people, lead people to their strengths and transform people’s experiences. For the future, Hammond is exploring the idea of creating a Cross Cultural Center at the USU. It would possibly house the DREAM Center Veteran’s Resource Center, the Pride Center and the Women’s Research and Resource Center in the same building.